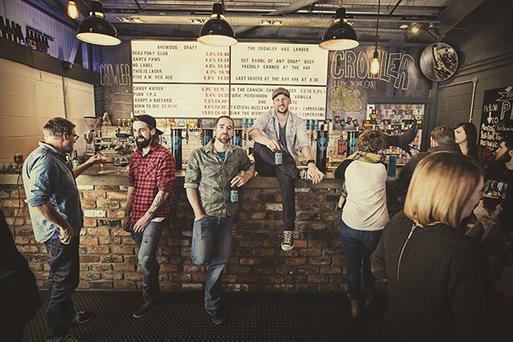 BrewDog is bringing its Cinematic Circus to Dublin’s Weston Airport on Saturday, July 7. More than just an excuse to toast the sun, the epic one-day event is set to become a rite of passage for any craft beer aficionado. Running from 4pm until late, it’s a celebration of some of the most important brewers and microbreweries of the craft beer revolution, spiced up with a side order of street food, live music and entertainment. Ireland has one of the most exciting and dynamic craft brewing scenes in the world. After decades of the beer market being dominated by giants such as Heineken and the Carlsberg Group, there’s now a strong consumer movement to support local breweries who are playing with flavours and creating something a bit different. ‘Punk’ brewery BrewDog, one of the grassroot players of the movement, is collaborating with the trailblazers of the Irish scene to celebrate all that’s great about our craft beer industry. It’s embarking on a cross-country voyage from Scotland to Ireland to bring these super-fresh beers straight to the eager hands of the people… on an airport runway, of course. On the day, hop-heads can experience the full spectrum of quality, thirst-quenching brews from the likes of Wexford’s YellowBelly, the Kildare Brewing Company, BrewDog, Wicklow Wolf, Stone Barrel and Dot Brew, the Dublin nano-brewery renowned for barrel-aged beers and BrewDog, with over 120 taps of freshly-brewed beer lining the hangars of Weston Airport. While craft beer takes centre stage, handcrafted spirits are also having a ‘moment’ and the festival will also pay tribute to that. Independent distillers, Lone Wolf, will hit the party to conjure up decadent cocktails, allowing festival-goers to fall for the intoxicating charms of their handcrafted gin, whiskey and vodka selections. Think crisp gin and tonics and sultry vodka mojitos. Ireland’s only wine-tap specialist, Wine Lab, will also be on hand to woo wine lovers with a choice of new and old-world picks. Few urges are as domineering as the one that compels a person to seek food after a few beers and hungry customers will have the chance to navigate their way through an incredible selection of street food vendors, showcasing some of Ireland’s much-loved eats. Punters can choose from the tasty wares of Dough Kitchen Pizza, Oh Yeah Doughnuts, Flamin’ Good BBQ and O’Brien's Traditional Ice-Cream, before kicking back and relaxing on sofas, deck chairs and old cinema seats to savour the flavours and soak up the atmosphere. This is so much more than just eating and drinking. This is a party. When it comes to live entertainment, scouts have been hitting Dublin’s Grafton Street ahead of the one-day spectacular to find some of the country’s most promising unsigned talent. They’ll handpick three buskers to busk at the event and one act will be selected to hit the main stage in support of Mullingar band Fallen Lights. Cult horror movie classic The Shining will be screened from Ireland’s largest HD mobile movie screen. And there’ll be a performance from Britain’s Got Talent finalists, Circus of Horrors. The act, which has been banned from several venues, is not for the faint-hearted. Revellers will be treated to fire, sword and acrobatic stunts alongside Victorian-style freak shows with Gothic, Steampunk, Burlesque and Voodoo elements. So that’s everything that’s great about festivals distilled into one, single-day celebration. They do say that beer tastes better in the shadow of an airport hangar on a summer’s day (they don’t) but perhaps there’s something about drinking on a runway, while live music, circus performances and horror movies, buzz all around you, that enhances the experience? There’s only one way to find out. Hail the ale! BrewDog’s Cinematic Circus is on sale now. As an Independent.ie reader, you have the chance to save 50pc on ticket prices by using the unique code CIRCUS50. Tickets are limited, so book your place today by visiting www.brewdog.com/circus. Tickets are available to over 18's and are priced at just €16. BrewDog is operating Challenge 25 on the door and at all bars if you look under 25 be prepared to show that ID. BrewDog have made it easy to get to and from Weston Airport with free parking on site. A free non-alcoholic BrewDog Nanny State beer will be provided to designated drivers at the event. A complementary bus service will operate from collection points at Leixlip and Celbridge every 15 minutes between 4 and 10pm and a later service will take people from the event to Leixlip and Celbridge between 10pm and 1.30am. The 67 Dublin bus service stops directly outside the front gate on Celbridge Road. Hazelhatch train service is situated nearby and buses will service this route between 4pm and 11pm. The station is a six-minute walk to Weston Airport.